Finding Groom Suits for The Suave & Stylish Tuxedo Wearer! Just like people, groom suits have changed with the times. In the past, there was only one choice when it came to what a groom would be wearing on his wedding day a classic black tuxedo. Regal mens tuxedo suits are grand. But in this day, the decision is not simply a black or white issue. Designers are offering more choices for the fashion-conscious men of today. Especially with fashion trends for men changing by the year. With new cuts and looks in groom suits, men can look both classy and unique on their wedding day. 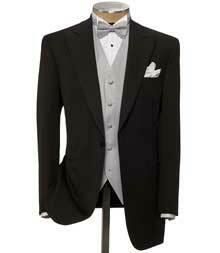 Tuxedos have been a staple of formal celebrations since the 1880's. Tuxedo fashion is advancing greatly in the 21st Century! For instance, For many men the "bow tie and cummerbund" look has been done ad nauseam. So they have moved on to the "vest and tie combination" instead for a very slimming look. And which also come in a wide array of colors. All in all, for the truly suave & stylish man, there are many decisions to be made when selecting groom suits. This aint the Wildcat offense, so no running all over the place! You cannot leave your tuxedo search until 2 weeks before your wedding day like you did when you were 17 years old for the prom. This day is far too important and your future wife is expecting far more from you. So please don't disappoint! Start looking early, in order to find the best groom suits, to get your guys together to order at the same time, to make sure what you want is available the weekend of your wedding and to make changes if necessary. Especially in the peak wedding periods(late spring to early fall), even more so at prom time in May. Hundreds of young guys are grabbing tuxes for their own big night. So demand is high and the top tuxes will rent out early. Start working on your tuxedo rental atleast 6 months before the wedding day. The VERY latest date to order would be near the 3 month mark. Please fellas, understand that this MUST NOT be taken lightly, tuxedo rental requires early action on your part! IS BUYING A TUXEDO BENEFICIAL? Buying mens tuxedo suits is becoming a more and more popular option these days. Is your social calender usually filled with events such as fundraisers, premieres, formal dinner/dance parties, the opera, and other ultra-formal weddings? If so, mens suits will be needed and it may be wise to invest in buying you own tuxedo. Find Hundreds Of Cufflinks On Sale! What Makes Custom Suits So Special? jpgBuy Her A FAKE DIAMOND? ?